When phoebe joined the post in 2017 she had no idea the adventure she was about to have. In the following year she went caving, rock climbing, and mountain climbing. She instantly fell in love with the adrenaline and thrill the outdoors can offer. Phoebe also is a certified member of Multonmah County Search and Rescue, it’s one of her proudest accomplishments. Phoebes favorite thing about the post is the loving and welcoming community. If you’re on a climb with Megan, you can bet almost of all the pictures with her will include her striking a silly pose. In the others, she’ll just be too busy being a mountain goat or looking at rocks intently. 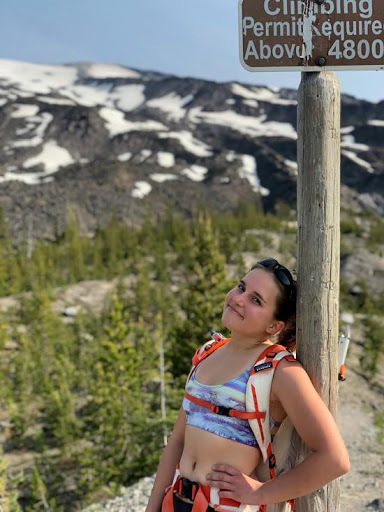 But as for the details, Megan is a senior in high school, this is her second year in the Post, and she is one of the fabulous hiking coordinators! She loves the outdoors, animals, and just overall being really awesomely uniquely weird. Lauren got hooked on rock climbing at eleven years old, she quickly began climbing in indoor competitions and taking trips out to Smith Rock on the weekends. She was introduced to the Post 58 in seventh grade when she met them at Smith Rock. As soon as she could, she joined the organizations and has been going on trips ever since. In the past year, she has further explored mountaineering on Post climbs, the legendary Canada trip, and an all-female expedition in Alaska. This year, Lauren is coordinating climb nights for the Post, and trying to get as many new climbers into the gym as possible!